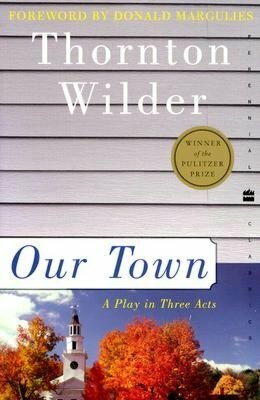 I have loved Thornton Wilder’s Pulitzer Prize winning play, Our Town, since I was fourteen or fifteen. I was trying to figure out how I would have come into contact with it, as I certainly didn’t read it while in school. My best guess is that it was because of Robby Benson, who starred in an adaptation of the play which must have aired on television. If you are a regular visitor to this blog, then you know that Robby and I go way (way) back. I probably purchased my copy of the play around then – it’s an Avon paperback which, according to the cover, cost $1.75. (I know, eh?) It’s dog-eared and highlighted and marked up and the words contained within still, after all these years, move me. In the Foreward of the HarperPerennial edition of the play Donald Marguiles, an American playwright and professor, calls Wilder “the first American playwright.” Marguiles further posits that Wilder paved the way for many of the playwrights who came after, and are perhaps better known: Albee, Williams, Miller. First produced for the stage in 1938, Wilder’s play takes place in Grover’s Corner, New Hampshire. The play is performed on a bare stage. The actors mime their stage business. For theatre goers attending that first production, Wilder’s play must have seemed wildly modern. Our Town could be any town. That’s the point. The characters on the stage are us. The three act structure of the play mirrors the circle of life: birth, love and marriage, death. One might easily argue that nothing happens. Yet the exact opposite is true: everything happens. The Stage Manager guides us through the play. Our Town is a fine example of metadrama; that is a play which draws attention to the fact that it is a play. The Stage Manager acts both as a sort of Greek chorus and bit player. He has the power to alert the audience to events in the future and to allow characters to revisit the past, as he does – famously – for Emily in Act Three. The language of the play is simple. Characters speak colloquially. They are just average citizens, concerned with the weather, town gossip, and their children. Even my class of grade ten students were able to see themselves in George and Emily. It is a tribute to the timeless quality of the play that despite the intervening years – from the play’s debut until now – not much has changed. DR. GIBBS: Well, George, while I was in my office today I heard a funny sound…and what do you think it was? It was your mother chopping wood. There you see your mother – getting up early; cooking meals all day; washing and ironing – and still she has to go out in the backyard and chop wood. I suppose she just got tired of asking you. And you eat her meals, and put on the clothes she keeps nice for you., and you run off and play baseball, – like she’s some hired girl we keep around the house but that we don’t like very much. As a teenager I would have certainly seen myself in that passage. Now, I see my own children. We are all the same: we are born, we live and we die. The Stage Manager remarks that even in Babylon “all those families sat down to supper, and the father came home from his work, and the smoke went up the chimney, – same as here.” It underscores one of the play’s motifs: time and its passing. What do we know of those people? “…all we know about the real life of the people is what we can piece together out of the joking poems and the comedies they wrote for the theatre back then,” remarks the Stage Manager. In Our Town‘s final act Emily comes to the same realization, albeit too late. “Do human beings ever realize life while they live it? – every, every minute?” she cries. Perhaps my students aren’t quite ready to acknowledge life’s brevity. I know, for sure, they don’t live “every, every minute.” Why should they? I didn’t. I don’t. Wilder’s play is a powerful reminder, though, that we should. And that message is as meaningful now in 2013 as it was in 1938. This entry was posted in Uncategorized and tagged 2013, drama, highly recommended, prize winner by Christie. Bookmark the permalink.